Sleepwalking through each week that we're apart. The letter that I sent you has gotten no response. And I wait and I dream, I'm made of steam. At the close of 2012, DENGUE FEVER, a band widely recognized for its trademark blend of 60’s Cambodian pop and psychedelic rock, proudly announced the launch of its homegrown label, TUK TUK Records. The band’s newly established independence marks yet another chapter in the continual evolution of a group unlike many in the Los Angeles music scene. To commemorate the inception of TUK TUK, the band re-released its first LPs, including its long out-of-print eponymous debut (2003) and its critically acclaimed sophomore, Escape from Dragon House (2005). Amazon.com named Dragon House the #1 int’l release for 2005, and Mojo Magazine named it in their Top 10 World Music releases of 2006. Each album has been expanded into a deluxe edition with rare and unreleased bonus tracks from the band’s archives. The label has a slate of releases on deck for 2013 including more deluxe re-issues, new material, and tons of previously unreleased recordings. Up to now DENGUE FEVER have released four critically acclaimed LPs, as well as a compilation of rare Cambodian gems, Electric Cambodia, and the inspiring documentary of its 2005 Cambodia tour, Sleepwalking Through The Mekong. Since the start of the band in 2002, their creative output has led them through a multicultural genre blend of psychedelia, surf rock, afrobeat, and spaghetti western to name a few; while their bold experimentations garnered praise from critics and fans alike. The HBO hit series True Blood named an entire episode after one of their songs and featured the band’s music. More recently, DENGUE FEVER’s music has appeared on CBS’ CSI: Las Vegas, The Hangover Part II and numerous independent documentaries. Spin Magazine highlighted the band in their ‘Breaking Out’ section, and band profiles have appeared in the New York Times, Mojo, Magnet, Wired, NPR’s “Fresh Air” and Radio Australia. DENGUE FEVER’s inception began in the late 90’s on a dusty, underdeveloped road en route from Siem Reap to Phnom Penh. Ethan Holtzman was traveling with his friend in an old, beaten pick up truck. He peered through the window at his pallid companion who sat in front, quietly suffering from a viral contraction of dengue fever. Suddenly Ethan’s ears caught the captivating melodies of 60’s Cambodian rock wafting from the radio each time he poked his head to check on his friend’s worsening condition. The driver’s cassette tape was looped back to back for the entire eight-hour drive to Phnom Penh; and as things go, the bumpy road to the capital germinated a seed of inspiration. After a 6-month trek through Southeast Asia, Ethan returned to Los Angeles with a suitcase crammed full of Cambodian cassette tapes. At the same time, his brother Zac Holtzman, who had discovered the genre on his own while living in San Francisco, returned to Los Angeles after the disbanding of his country alt-rock band, Dieselhead. The brothers soon reconnected over their love of vintage Cambodian rock and founded the band, DENGUE FEVER. With Zac designated as lead guitarist and Ethan as keyboardist, the brothers expanded the band with saxophonist, David Ralicke; drummer, Paul Dreux Smith; and bassist, Senon Williams. Shortly thereafter the members were on hot pursuit for the ideal Cambodian chanteuse to complete their outfit. “We saw Chhom Nimol at The Dragon House,” Zac recalled. “She was already a star in Cambodia and made a living singing traditional music at Cambodian weddings and parties.” Nimol came from a lineage of popular singers for Cambodia’s royal court. As soon as she reached of age, she emigrated to the States looking for work, where she was quickly embraced by the Cambodian-American enclave of Long Beach, California. When approached by the Holtzman brothers, Nimol hesitated. After several missed band rehearsals, she eventually signed on as DENGUE FEVER’s lead vocalist when she realized the band shared a genuine passion for the folk and popular culture of her native country. As a child she was familiar with the golden era of 60’s Cambodian rock and pop music, a cultural movement headed by Sinn Sisamouth and Ros Sereysothea, two musical icons whose lives were brutally cut short by the Khmer Rouge’s draconian regime. Nimol, who was born in Battambang, the same city as Ros Sereysothea, did not want them to be forgotten after their senseless deaths; she longed to shine a light on their beautiful oeuvre. “When we first witnessed the power of Nimol’s voice filling the hall,” Ethan recalled. “My brother and I were floored. We knew that she was the one.” The singer’s impressive chops, aglow with luminous vibrato and hypnotic stage presence befitted the band’s driving Cambodian psych rock vibe. DENGUE FEVER was an immediate hit, both in the Cambodian clubs of Long Beach and LA’s rock venues from The Echo to the Hollywood Bowl. Eminent musicians from around the world took notice of the band’s rise. After playing an inspired set on the Jools Holland Show, Ray Davies, from the Kinks, touted them "a cross between Led Zeppelin and Blondie.” They won LA Weekly’s Best New Artist Award in 2002, and actor/director Matt Dillon asked them to record a Cambodian version of Joni Mitchell’s “Both Sides Now” for his directorial debut City of Ghosts. DENGUE FEVER’s musical sensibility has always featured the members’ diverse and progressive approach to songwriting and arrangement. Their eponymous debut (Web of Mimicry) predominantly featured covers of Cambodian classics, a poignant and rocking tribute to the singers and songwriters who perished under the Khmer Rouge. The album also featured “Ethanopium,” an instrumental cover of a song by Ethio-jazz legend, Mulatu Astatke, used in Jim Jarmusch’s film, Broken Flowers. DENGUE FEVER’s second album, Escape From Dragon House (M80), written almost entirely by the band, dove into a psychedelic realm—its freer and more experimental approach largely defined their unique sound. Their standout track, “One Thousand Tears of a Tarantula,” is a homage to Ros Sereysothea that tells a story of the Khmer singer forced to strip naked and sing in circles beneath the merciless sun until she dropped. Metallica’s Kirk Hammett has handpicked “One Thousand Tears” for his Rolling Stone magazine Best Music Of The Decade Ballot as the number two slot in order of importance. The critically acclaimed song was later featured in The Hangover Part II and the Showtime series, Weeds. Real World Records Founder and musician, Peter Gabriel, licensed their third LP, Venus on Earth (M80), and described DENGUE FEVER as: "They're California-based but have taken '60's Cambodian pop as their main source of inspiration and it's done with style. It's spirited, impassioned." Two songs from Venus, “Sober Driver” and “Tiger Phone Card,” featuring Zac and Nimol’s humorous, lovelorn duets, are instant crowd pleasers during live shows. Both songs touch upon relationship difficulties ranging from drunken callousness to the unbearable loneliness of a long distance affair between New York and Phnom Penh. DENGUE FEVER recorded their latest release, Cannibal Courtship (Fantasy Records/Concord Music Group), shortly after their invitation to the Womad festival in New Zealand. They shared the stage with Seun Kuti and Fela’s legendary band, The Egypt 80, an incredible live experience, which influenced their recording process. On the song, “Only a Friend,” funky afrobeat rhythms found their way into the sundry arrangements. Other notables include “Cement Slippers,” their fuzzy psychedelic, sun-drenched surf rock duet, and “Uku,” their rapturous return to hypnotic Cambodian folk highlighting Nimol’s soaring ornate vocalization. 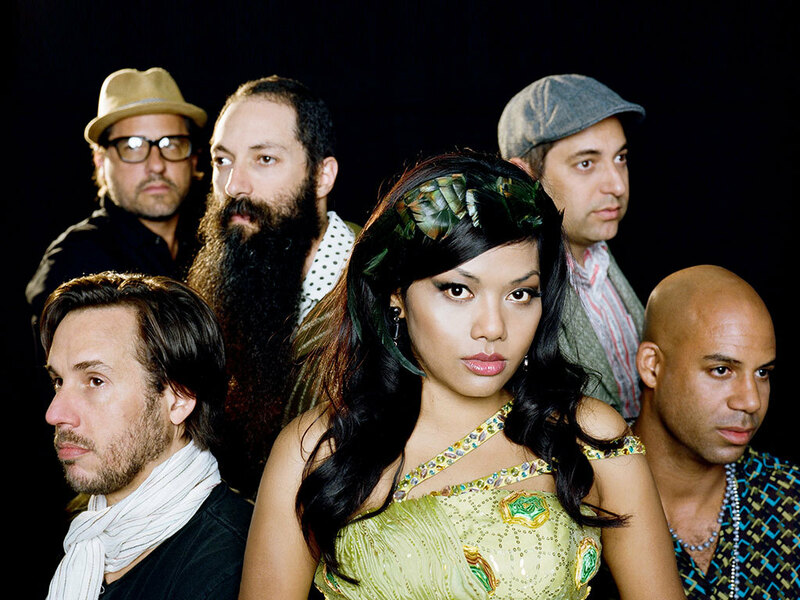 DENGUE FEVER’s uniquely accessible multicultural sound has allowed them to transcend physical borders as easily as musical ones. Beyond their popularity in the United States and Cambodia, the band has toured to hungry audiences all over Europe, as well as Turkey, Vietnam, Brazil, Mexico, Laos, and New Zealand. In April, 2013, the band will open the Season of Cambodia festival, a month-long curation of classic and contemporary Khmer art in New York City. Keep your eye on the news: DENGUE FEVER is spreading.